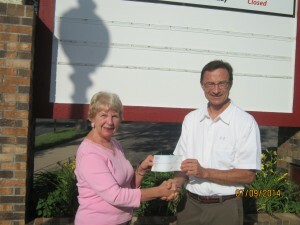 Walk On Waconia donated $6,607 to the Waconia United Food Shelf on July 9th. Walk On Waconia participants also donated 602 pounds of food to the food shelf on the day of the event. The Walk On Waconia is an annual 10 mile walk/run around Lake Waconia starting at St. Joseph Catholic School. The event takes place every April and also includes a 10 kilometer option for runners and walkers. This year’s event, the ninth annual, attracted an event record 470 participants. The Walk On Waconia is organized by St. Joseph Catholic Church with the support of Unhinged Pizza, Koch Bus, Mocha Monkey, Promise Church, Trinity Lutheran Church, Oakwood Church, ParkSide Church, Faith Lutheran Church, Waconia Moravian Church, Waconia Fire Department, and Carver County Sheriff. Lakeview Clinic and Ridgeview Medical Center are major sponsors of the event. Tim Litfin, Director of Walk On Waconia, presents Marty Cramer, Director of Waconia United Food Shelf, with a check.